This intellectual biography brings to light a complex, fascinating woman who bridged many worlds--the United States and Mexico, art and politics, professional work and family life. Journalist, historian, anthropologist, art critic, and creative writer, Anita Brenner was one of Mexico's most discerning interpreters. Born to a Jewish immigrant family in Mexico a few years before the Revolution of 1910, she matured into an independent liberal who defended Mexico, workers, and all those who were treated unfairly, whatever their origin or nationality. In this book, her daughter, Susannah Glusker, traces Brenner's intellectual growth and achievements from the 1920s through the 1940s. Drawing on Brenner's unpublished journals and autobiographical novel, as well as on her published writing, Glusker describes the origin and impact of Brenner's three major books, Idols Behind Altars, Your Mexican Holiday, and The Wind That Swept Mexico. Along the way, Glusker traces Brenner's support of many liberal causes, including her championship of Mexico as a haven for Jewish immigrants in the early 1920s. This intellectual biography brings to light a complex, fascinating woman who bridged many worlds—the United States and Mexico, art and politics, professional work and family life. Susannah Glusker lives in Mexico City, where she teaches "Women of Mexico" at the Universidad Iberoamericana. Anita Brenner put down the phone and let out a whoop of indignant laughter: "Well, of all the nerve. Awarding an Aztec Eagle to a Mexican!" She was delighted, of course, to have been recognized for more than fifty years of writing about Mexico for an English-speaking audience. She was even more pleased to refuse the Aztec Eagle--the highest award granted by the Mexican government to foreigners--on the grounds that she was Mexican by birth. Mexico and the United States have been interdependent for many years. The relationship between them exists on two levels: the formal one, involving governments, treaties, boundaries, and trade, and the personal one, between people who walk across the border. Some travel north to the "land of opportunity." Others travel south in search of fortune or simply adventure. People also cross the border, in both directions, to seek a haven from political persecution. They have been traveling back and forth, meeting, marrying, painting, and writing, for centuries. They compare lifestyles and document their reflections in a vast literature about U.S.-Mexico relations. Anita Brenner's life (1905-1974) is a good example of a woman at home in both countries. She was born in Aguascalientes, Mexico, and educated in Texas and New York. She lived in Aguascalientes until the age of eleven, then in San Antonio, Texas, until the age of eighteen, when she returned to Mexico. After four years in Mexico City, she left for Columbia University in New York in 1927. She remained in New York for seventeen years, returning to Mexico City in 1944. She lived in Mexico until her death in 1974. Her familiarity with both sides of the border gave her the expertise to make Mexico known to an English-speaking public. It was the Mexican Revolution of 1910 that sent Anita's family north from Aguascalientes to Texas three times, the last, in 1916, permanently. Moving back and forth had a major impact on her life, work, and way of thinking. Throughout her life she identified with the struggle of the Mexican people during the revolution. Born shortly before the revolution began, she witnessed the armed struggle, the dead and wounded, as well as efforts to reconcile differences. She had firsthand experience as a refugee and displaced person. Anita retold the story of that revolution in the two books for which she is best known: I dols behind Altars and The Wind That Swept Mexico . She included stories she heard from her nanny, Nana Serapia, in both books. The Wind That Swept Mexico was the first complete account of the Mexican Revolution in English. It has been reprinted for more than fifty years, and the University of Texas Press currently considers it among its best-sellers. In the following chapters, I have summarized the main issues and events of the revolution simply to provide readers with the context of Anita's life and work. The Mexican Revolution is said to be among the best-documented conflicts in history. It was covered by independent journalists such as Lincoln Steffens, who sought interviews with powerful leaders who fascinated him on both sides of the border. John Kenneth Turner's interviews were published as Barbarous Mexico and are still in print in Spanish. John Reed joined the front lines of battle. William Randolph Hearst sent reporters, photographers, and filmmakers to record real battles. Hearst also openly distorted information and published forged documents in an effort to rouse anti-Mexican feeling in the United States. He had his own agenda: get Congress to approve sending U.S. troops to Mexico to reinstate the Diaz government and revoke the new constitution. He was determined to retain the land he owned in Mexico at whatever cost. 'The Hearst reports can be considered forerunners of the U.S. tendency to publish sensationalized negative news about Mexico, now commonly called "Mexico bashing." Anita Brenner's work is the exact opposite. She presented Mexico in a positive light, stressing the Mexican point of view. She was one of two journalists who consistently depicted Mexico positively in the New York Times . Her position was that of an independent liberal who defended workers, the disenfranchised, or those who were treated unjustly, no matter what their origin. She, like many Mexicans, was angered by U.S. attempts to interfere, and she felt that the Mexican people had a right to run their own revolution and country without foreign intervention. In her words: "Due to having been born in Mexico, I have tended to side with the underdog and be sympathetic to rebellion and revolution whose deepest psychological, economic and social roots have always intrigued me and into the research of which I have put much time." The key to unlocking Anita's life is the title of her column, "A Mind of One's Own," which closely defined her spirit. Anita pursued justice in the biblical sense of the prophet Isaiah, without wrapping herself in a robe of sanctity. She was very much a woman of her times. She could be a relentless, cocky personality with more projects on her desk than she could handle. She was also a charming hostess, with the gift of making irreverent remarks that stopped conversations. That drive for an independent way of thinking is a major pattern throughout Anita's life. Her earliest published work defended Mexico as an appropriate place for Jewish immigration. She was a self-taught journalist who wrote about Mexico, its art, and its people. She joined radical intellectuals in New York involved in the Spanish Civil War and in issues of political freedom in the thirties. She organized and worked with groups focused on concrete goals, not ideologies. She read Marx but did not identify herself as a Marxist. She helped Trotsky come to Mexico without considering herself a Trotskyite. She shared activities with members of political parties without affiliating with any party herself. Some of her friends reported that the Communist Party would not have her, others that she would not have joined. Anita's professional life as a journalist was not limited to defending causes. She contributed regularly to the Brooklyn Daily Eagle as an art critic, wrote a column in Mademoiselle entitled "A Mind of One's Own," and wrote three books about Mexico: Idols behind Altars , Your Mexican Holiday , and The Wind That Swept Mexico . She also wrote five books for children: I Want to Fly , The Boy Who Could Do Anything , Dumb Juan and the Bandits , A Hero by Mistake , and The Timid Ghost . In later years she founded, edited, and published an English-language periodical, Mexico/This Month (1955-1972). The publication was popular among public-school libraries in the United States and subscribers. The Mexican government purchased a block subscription to send to its embassies and consulates all over the world. The challenge of analyzing Anita Brenner's life and work called for following and understanding diversity. Her work is multidisciplinarian and multifaceted. Anthropologists see Anita primarily as the author of Idols behind Altars . Jewish intellectuals see the person who defended Mexico as a place for immigration and who fought anti-Semitism. Art historians credit her with making the artists of the Mexican Renaissance known in New York. Some Mexicanists see her through her articles in the New York Times Sunday Magazine . A few recall her work as an art critic for the Brooklyn Daily Eagle , The Nation , or the New York Times Sunday Magazine . Veterans of the Spanish Civil War remember her exposé of the underground police group known as Chekas. Mexicophiles remember the seventeen years of Mexico/This Month . Most of her work listed in the bibliography is related to Mexico. And yet, for some, Anita is remembered for growing first-rate asparagus. My mission--to learn just who Anita Brenner was before I knew her as my mother--led me to embark on a long process of asking, reading, listening, and analyzing what I found. I sought to understand her within her context and time, through the issues and controversies in politics, art, and history. The chapters, therefore, are organized around those topics, rather than in strict chronological fashion. I chose to focus on her work from the early twenties through the mid-forties because it was the period when she wrote the most. My information and conclusions are based on personal experience, interviews, her journals, correspondence, and articles. (Her archives are a rich resource for future study, such as an analysis of her poetry, the influence of her work on U.S.-Mexican relations, or the contribution of Mexico/This Month in promoting Mexico.) Through her writings I came to know her as an intellectual who was affected by the great currents of her time and who contributed as an art communicator, as a critic, as a woman, and as a Jew. The experience was enriching beyond all my expectations. Her lifestyle as a mother, wife, sister, and daughter is touched on briefly as pieces of the puzzle of her ideas and professional development. They could be subjects for a later book. I hesitated to define her family roles for two reasons: first, because the more I read, the more intrigued I became with her writings, with her ideas; and second, because my mission was to explore, not to define. The material I found indicated an overlap between her professional and personal life. Just as an anthropologist would see her differently from an art historian, I sense that each member of her family would have a different view of her life, work, and role. My goal was to understand her professional accomplishments. The Anita Brenner I knew, and the one I discovered through research, did not match any paradigms described in the literature about mother-daughter relationships. Anita's passion for Mexico was engraved in her soul. It set a pattern in her writing that paralleled the struggles of the Revolution and of the underdogs she championed. She expressed it in the opening lines of Your Mexican Holiday : "Once the dust of Mexico has settled on your heart, you have no rest in any other land. So goes the proverb." Many years later, when she ran a contest in Mexico/This Month for the best translation of that proverb, she confessed that she had made it up. Anita carried that same passion into her writing about the Spanish Civil War, and it propelled her beyond writing into concrete action to change what she felt was wrong. Anita was both a Mexican and American citizen during her lifetime, legally and figuratively. She was born a Mexican and died a Mexican. She contributed to making Mexico known to an English-speaking audience with information that remains timely, more than fifty years later. Unfortunately, the conditions that led to some of her writing have also persisted. Mexico is still largely misunderstood by many people in the United States, and the country is still very much locked in a struggle between the rich and the poor. The same players figure in the ongoing story: large landowners, powerful industrialists, the Church, and those struggling for their rights. Today the entire cultural activity of Mexico is colored half by Marxist theory and half by an intense, Indianophile nationalism. [...] since a mind in conflict tends to express itself in skepticism, satire and acid laughter, the national temper is full of doubt and anguish overlaid by a certain kind of sardonic humor. Rarely will a Mexican, even talking casually with friends, reveal his real thoughts and feelings. Instead, he will make epigrams, witty caricatures, talk solemn absurdities, smiling a cryptic smile. In everything he says there will be an ample margin of fantastic laughter, directed especially at the grim, the painful and the horrible. [...] Deeper under these details of emotion, there is a real fear that Mexico will be swallowed up, peacefully but inevitably conquered, by American capital, and the treatment that he and his countrymen have generally received in the United States makes a nightmare of the American in his own land. [...] The worker and the peasant feel, with varying emphasis, much the same conflicting emotions. interested in getting some close notion of what is happening, and in meeting some of the people who are key to the horrendous horizon in Latin America. I am torn between realizing that one relatively small voice can't do so very much, but on the other hand the scales are so delicately balanced at the moment that if only the wrong things aren't done a lot of danger could be averted, and it seems to me practically an obligation at least to do what I can. Anita was recognized for her work during her lifetime, and she enjoyed the positive feedback. The first major occasion came with the publication of Idols behind Altars (1929). At the same time, she was placed on the Jewish Honor Roll in the New York Times along with Waldo Frank, Walter Lippmann, and Ludwig Lewisohn. She was pleased to receive a citation from the University of Florida at Gainesville for outstanding work in American studies in 1955. It gave her an opening to pursue a new edition of The Wind That Swept Mexico . Some awards she enjoyed ironically, most notably her refusal of the Aztec Eagle. She did accept a citation as a distinguished tourism pioneer awarded by former president Miguel Aleman, who then headed a special committee to promote foreign tourism (1967). Sometimes recognition took the form of a generous speaker's fee. 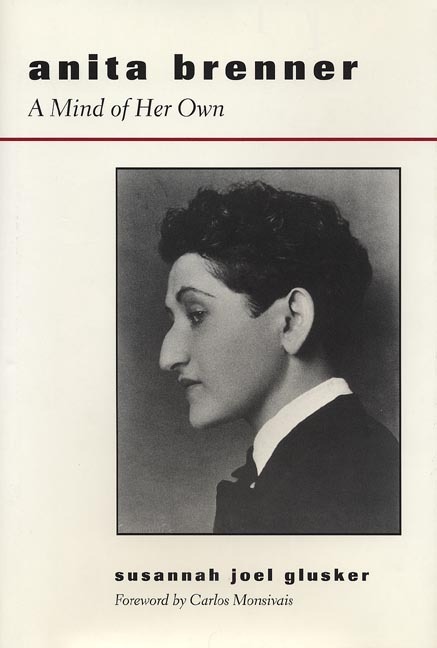 Anita kept a busy speaking schedule in the early thirties, promoted by the Menorah Journal Speakers Bureau. In Mexico, it was IBM that hired her to speak at several meetings honoring outstanding staff. "So Anita, David, and their friends from New York schemed and decided to hold a picnic in the midst of the 'silly' party. They packed the baskets with meat to cook, flit guns [pesticide sprayers] for the flies and mosquitos, thermos jugs full of coffee and lemonade, and a charcoal brazier. When they got there they spread out their petates (woven palm mats), laid out the food and equipment, built a fire, and kept up loud and jolly conversations. When the other guests approached, they did not respond, after all, they were only 'rude tourists'! Smoke permeated the entire house, and they departed, leaving eggshells, wads of crumpled wax paper, without a proper good-bye. 'The rich lady wanted it silly, she got it silly!'" Anita's irreverent, outrageous sense of humor often prevailed. In sharing this book with you now, I recognize that sometimes reality sounds silly, sometimes sad, and sometimes serious, but there is no doubt that Anita had "a mind of her own."